A type of rye bread of Polish origin that can be prepared with a number of different recipes. Lighter versions of Polish rye are similar in color, flavor, and texture to New York rye bread due to a generous portion of wheat flour added to the dough. Other versions of Polish rye are similar to the dark rye breads of other Eastern European countries and Russia and are made with a courser grind of rye meal. 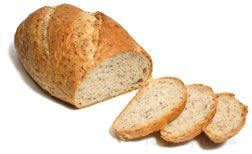 Many of the recipes for Polish rye bread, light and dark, feature caraway seeds, which provide additional flavor. Polish rye is excellent when served with hearty soups and stews.